Wingspan c. 8mm. It has four yellowish spots on the forewings, giving it a fairly distinctive appearance. 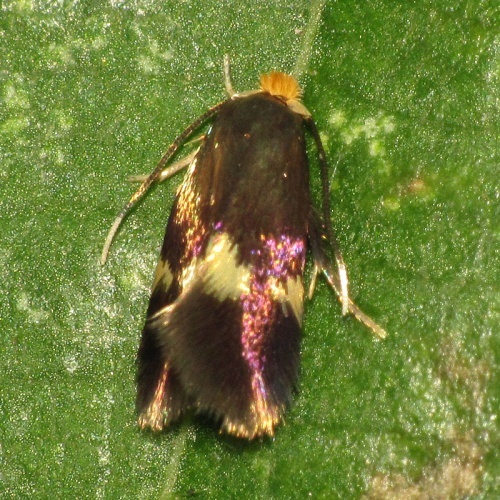 The adult moth is usually encountered by beating alder (Alnus) trees, and although little is known about its lifecycle, it is presumed to feed on this foodplant, possibly in the buds or the bark of twigs. A rather scarce and local species. It has a scattered distribution across parts of England with further records from Wales and Ireland. In the Butterfly Conservation’s Microlepidoptera Report 2011 this species was classified as Nationally Scarce B. The Narborough Bog NR specimen of 28 July 2011 is the first for VC55. L&R Moth Group status = D (rare or rarely recorded).